The older I get I feel like any minute now this bouldering stuff has to get boring right. But it really never does. I've taken my mind off projecting through the heat the past few months and instead focused on training for one of those bucket list type trips. I'm psyched to say that I'm finally going on my first trip to Europe for climbing. Spending a chunk of time in this part of the world has always been a dream of mine. After years of talking about it I realized you just have to do it. I know that Europe is a big place but I decided that Switzerland is the place that I've always wanted to see the most. So I'm going there pretty much solo with a loose plan. I hear it rains a lot so I'm preparing for the worst weather, but my greasy fingers are staying crossed. If the bouldering gods could grant me 45 days of sunshine, 15 mph breeze, and 55 degrees ( I really should practice my metric) then only my short legs can stop me. I'm extra excited about this trip. The boulders look first rate and everything else does too. Castles? cheap gelato? And CHOCOLATE! Holy crap. The list of problems I have memorized from countless swiss video binges is too big to print. I honestly can't wait for this trip. But I will have to for a few more weeks. Consequently, training is hard, and that will end soon too. In the meantime, I've been doing a lot of backpacking and bouldering outside of training. I can't seem to get off the new stuff. I've been testing out the new bouldering guidebook from our local dudes Dave Hatchett, Frank Lucido, and Jon Thompson. So far it's been getting me to all the right stuff. A few of the great ones I've done lately are Electric Chair v10, 2nd ascent Platinums; Entrance Exam v10, 2nd ascent? Benwood; Ashy to Classy sit start v9 Kirkwood Lake ; Grand Design v6 Kirkwood lake. All these are so sick. I'm having so much fun with access to all this new stuff. 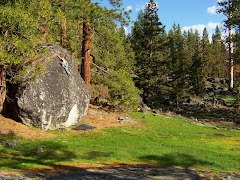 If you haven't checked out Lake Tahoe Bouldering Guides : South and East Shore Edition, then get it. In Tahoe, you can locate this new guide at Sports LTD in South Lake Tahoe, at the Sports Exchange in Truckee, Alpenglow in Tahoe City, or High Altitude Fitness in Incline Village. More recently I've been working on the video of my latest trip to Desolation. After Lake of the Woods, I knew I was ready to step it up to the more burly hike. I decided to go to the coolest destination I've found in Desolation, Lake Aloha. I've been going there every season for a few years now and it is still one of my favorite trips. Backpacking and bouldering combined. For me there's just nothing like it. When I'm out that far in the wilderness doing my favorite thing on earth, superficial thoughts are harder to come by. I get in this zone with the simplicity of it all. I realize that this is what I do, and I love it. Enjoy the video peeps.